Beginning in September of 2011, the U.S. Department of Education offered states the opportunity to apply for a waiver of several provisions of the Elementary and Secondary Education Act (ESEA) currently known as No Child Left Behind. 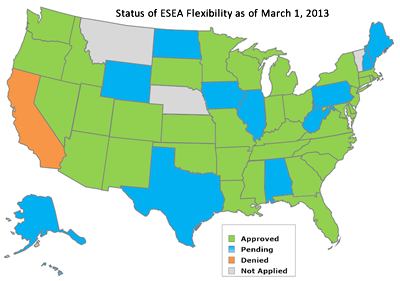 As of March 2013, 34 states and the District of Columbia have been given approval of their applications. Several more states have applications pending (see map). The Advocacy Institute has released a paper outlining several issues that could have a negative impact on students with disabilities in states with approved ESEA Flexibility (aka “waivers”). Click here to download the paper or read it online below.